Babawiin yata ang FPJ Award... tsk tsk. Hindi kasi masyado nag-click yun Enteng Kabisote 10. I believe there was a significant enough dip in its earnings compared to other festivals na nagtatampo na si Bossing. Firstly, it's a film festival. You'd want the best and brightest. Secondly, it's a film festival. You'd want the best and brightest. Thirdly, it's a film festival. You'd want the best and brightest. I could go on but I think these should suffice. Ghetto-izing the indies so yun panlasa ng mga masa ay hindi magbago and they can continue to peddle their garbage. I see it as an opportunity for indie movies to gain more exposure. So the Regal Films movies and Enteng Kabisote movies were previously ghetto-ized via the MMFF?!? 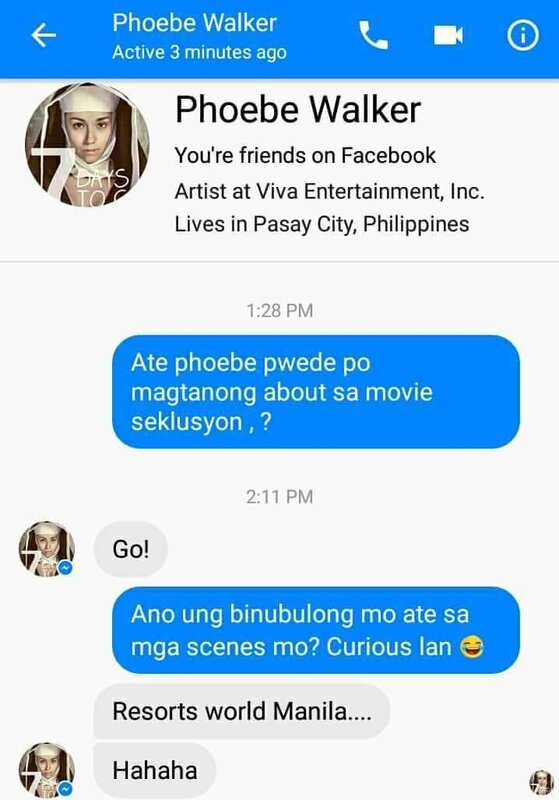 Tama ba ang pagka intindi ko na sa IF nailalabas ng mga film makers ang totoong kulay ng buhay? Mas mapangahas, ika nga. Kung si Liza Diño napaiyak daw nung napanood ang pelikula, bakit doon pa lang hindi inaksyunan? Sa mga nakapanood, masasabi nyo bang obvious na totoong aso ang pinatay? Ito lang ba ang IF na may kinatay na aso o baka naman meron na rin kaso lang hindi pinansin dahil nga indie? Kung ito ba ay hindi kasali sa MMFF, mapansin kaya o dedma lang? Pwede din siguro nagrelease na lang ng director's cut? Haven't seen ORO but if the dog slaughter is true, It's either the director is playing dumb or he is really dumb. They said the dog scene was from a footage of a community that have dog slaughtering as a part of their culture. So "technically", daw, they didn't harm any animal during the shoot. ^^ Maiintindihan ko pa kung real life documentary yung film but it's not. Ayaw daw nila makialam sa cultural community pero pinalabas pa din nila sa madla yung ginagawa nilang kahayupan edi ba pambabastos din yun? at kahit na documentary film man yun that scene should be removed due to our animal rights law, they are not making films from 70's-80's anymore. And question, hindi ba obligated ang filmmakers dito to get a PAWS or any individual to monitor every animal scenes in the movie? Sa Hollywood kasi meron e.
Cinemalaya, CinemaOne and QCinema are already indie film festivals doing their job to expose indie movies. The MMFF is not just for indie movies but for mainstream movies as well. What's different about the MMFF this year is they focus on quality, indie or mainstream, regardless of genre, rather than "box-office potential". Mainstream movies need to step up rather than just go auto-pilot on the usual Enteng movies and Vice Ganda trash. Yun resolution ni Tito Sotto is very self-serving. It's clear that his brother's movie, Enteng Kabisote 10 did not do as well in the box-office outside the MMFF. Why else would he file this bill? It's not out of concern for "the children" (ulol). It's concern for their pockets. They wanna keep making the same old trash without having to change their methods of pandering to the masses and just giving them what they think they want. Pwede naman gumawa ng pelikulang maganda na pambata o pang-masa eh. Para sa akin, hindi excuse ang "pambata" para gumawa ng pangit na pelikula na basura. Very well said, you nailed it. So, aren't indie movies being ghetto-ized by these festivals? In a way, naging daan na rin itong bagong approach ng MMFF to enlighten the industry sa mga limitations. Positive! Yun namang enteng and the like, nasanay na sa tubong-lugaw. one such film Isla, where her uncle asked Isabel, "ano ginawa sa iyo ni Aldo?. honestly the last MMFF movie I saw was Jose Rizal due to it being a school requirement. i never did see one during the holidays but was more interested in list of films this year compared to the previous being heralded. no need for floats here. they want their cut of the holiday bonuses and such. i think the good senator doesn't want quality, intelligent and social impacting movies for the masses. baka kasi hindi na siya iboto. For me, they should not stop the showing of the movie, though the concerned people must be given the appropriate censure and face whatever legal action possible. Saving Sally: The little Filipino film that needed saving. napanood ko na ang die beautiful. my HD release na.hehe. maganda ang kwento kaso ang haba. patalon talon pa ang kwento. 4 life stages ba naman ang ginamit. ang huling babae bang sumasayaw sa dulong part image ni jennifer laude yun? kasi dba sa kanya inspired ang kwento?